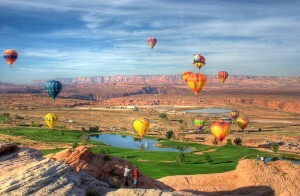 The 16th annual Page Lake Powell Balloon Regatta is right around the corner so make your plans now! Starting Thursday, November 1, and running through Sunday, November 4th, the regatta has a lot to see, learn, and participate in. The Balloon Regatta has become a staple of Page Lake Powell life and our draw gets bigger every year. What a back drop we have to host this festival ~ Lake Powell! With 62 Balloonists entered this year we should see some of our local favorites take to the skies. All launches, and the Glow, of course depend on the weather. Bryan Hill, Basketcase Pilot, and Balloon Meister, is again heading up this years event. The Balloon Committee and the Page Lake Powell Chamber of Commerce ensure its success every year. Click flyer to make larger which then can be printed. More on the vendor fair after the schedule! As always Thursday will rock the education arena at the local schools. It is a cool experience for the students to learn about the mechanics of hot air balloons and chat with the pilots. Friday morning will be the launch from Regatta Field and other locations usually around 7 a.m. After enjoying the beauty of the balloon morning come back downtown at 3:00 p.m. as the Friday portion of the vendor fair runs until 10 p.m.
Saturday morning features the 7 a.m. launch with the vendor fair starting up at 11 a.m. and going through 10 p.m.
Saturday night at sunset ~ THE GLOW! See the balloons lined up on Lake Powell Blvd, talk to the pilots, and watch synchronized lighting. Sunday 7 a.m. Balloon Launch. The Vendor Fair for 2018 looks to be a blast. Running two days, Friday and Saturday, the turn out should be great. There are more than 70 vendors this year including new food and our favorite standards. There will be a Lantern Launch Friday night at 7:30 p.m in City Park. Lanterns are $5.00 and go on sale at 6:30. Border Towns Horse Company will be set up by the big tent offering kid and adult rides as well as doing demonstrations throughout the day. Border Towns Horse Company is based in Big Water, Utah and are making a great name for themselves. The Balloons n’ Brews beer garden will be in the parking lot in front of the breezeway at Atkinson Mall. This year there are plenty of music acts. D.J. Serventi 5:30 to Close. On a personal note a couple of good friends of ours will be playing music at local establishments. Floating in from Colorado, Snyderfish, will be playing solo at Blue Wine starting at 9 p.m. Saturday. Head over for some good vibes- an eclectic mix of funky reggae and mellow groove. Tom Bennett will be at State 48. Tom is a full time, traveling, one man country and blues band from Georgia now based in Utah. Don’t miss these two great performers! 2018 Page Lake Powell Hot Air Balloon Regatta looks to be one of the best. Come out and support our community, the pilots, the vendors, the Chamber and lets keep Page one cool place to be in the desert!